The flavor of this tea is so rich and pure. It has a very clean, vegetative taste with no bitterness and a surprising amount of complexity – especially when one considers that this tea was brewed just 1 minute in a gaiwan! The dry leaves are a bit smaller than I’m used to seeing when it comes to a Dragon Well. As they unfurl, they reveal themselves to be tiny, young, WHOLE leaves that are just beautiful – almost breath-taking! – to behold. The aroma is floral with grassy notes, and this translates into the flavor except that I wouldn’t really call the flavor grassy. It is vegetative but not overwhelmingly so, and it’s more like a vegetable than a grass taste. There are notes of flower, hints of fruit, and even a very subtle nutty quality. The tea has a light astringency that gives a sense of continuity to the clean taste of the overall cup. But the dominate flavor of this cup is the buttery taste of it. No, it’s not like drinking a cup of melted butter, but the sweet, creamy butter taste of this tea is a fine compliment to the other notes of this pleasingly complex tea. And this tea stands up to multiple infusions, too! I managed five very flavorful infusions – each just as delicious as the one before it! 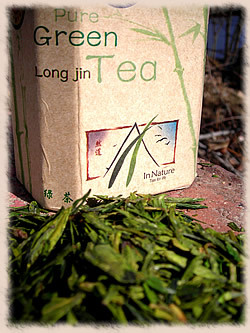 I am so thrilled that I had the opportunity to try this fine tea.